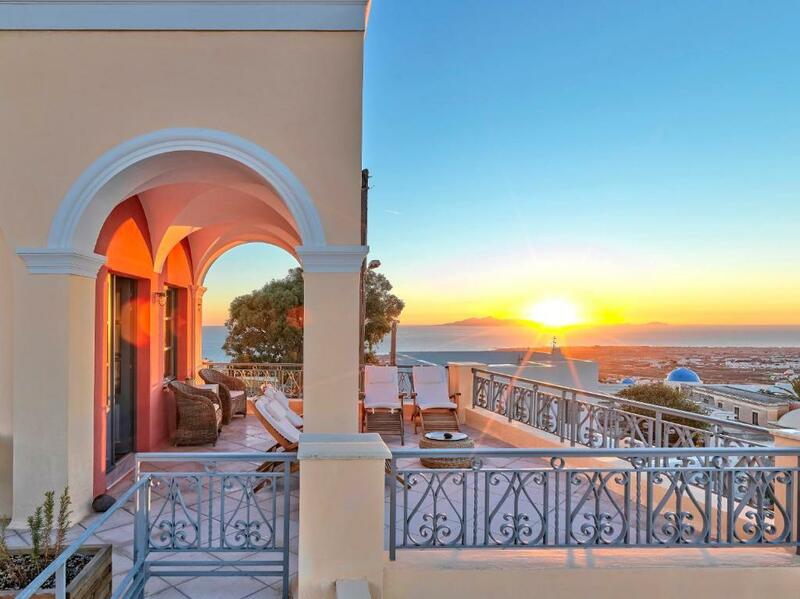 Lock in a great price for Archipel Mansion – rated 9.2 by recent guests! 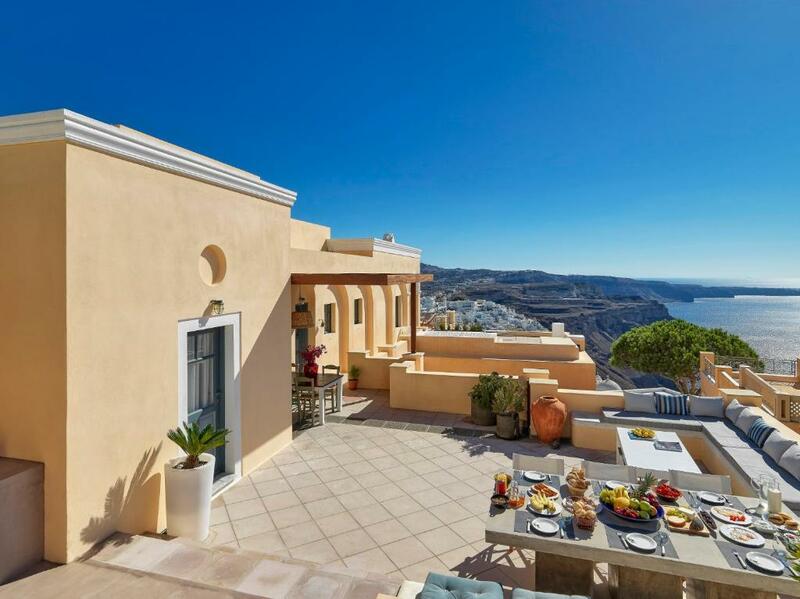 Centrally located in Fira, the neoclassical Archipel is housed in an old mansion and features spacious, furnished terraces with an outdoor hot tub and panoramic Caldera views. 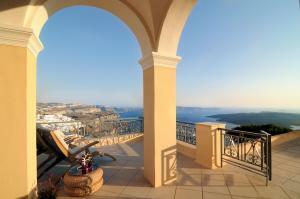 The split-level villa has a living room with fireplace and offers free WiFi throughout. 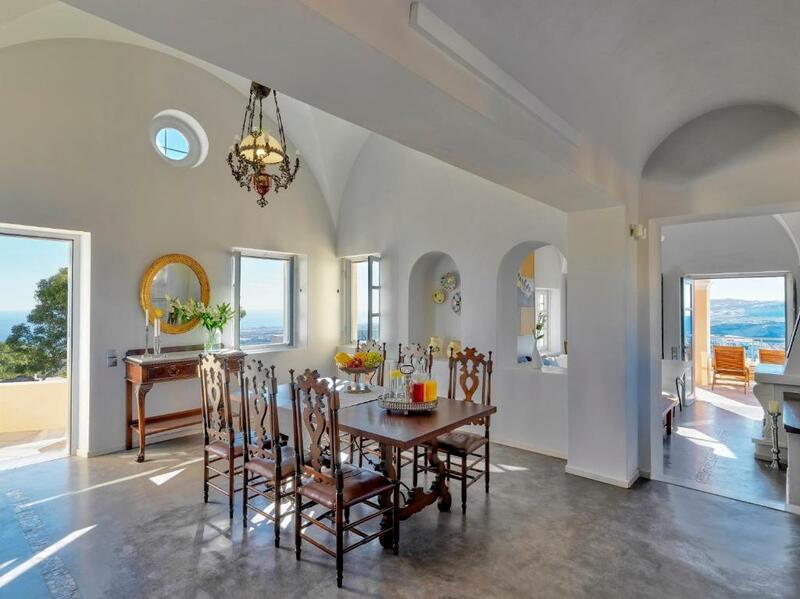 Consisting of the main building and a studio, Archipel villa is fitted with vaulted ceilings and arches and comes decorated with antique furnishings and contemporary artworks. It includes 4 bedrooms, a fully equipped kitchen and 1 kitchenettes, 1 living rooms and 3 bathrooms. Facilities include a stove, fridge, air conditioning and a flat-screen satellite TV with DVD player. Guests can prepare their own breakfast or other meal and enjoy it at the comfort of their terrace. Grocery shopping, packed lunches and a private chef can be arranged upon request and at extra charge. A welcome basket with water, wine and fruits is offered. Additional services include massage and beauty treatments, babysitting and concierge services on request. Transfer from and to the airport can also be arranged on request and at extra charge, while car rental services can be provided. Guests will find restaurants, bars and shops within a few feet from Archipel Mansion. Santorini National Airport is 3.1 mi away, while Ormos Athinios Port is at a distance of 5 mi. Free on-site parking is provided. When would you like to stay at Archipel Mansion? 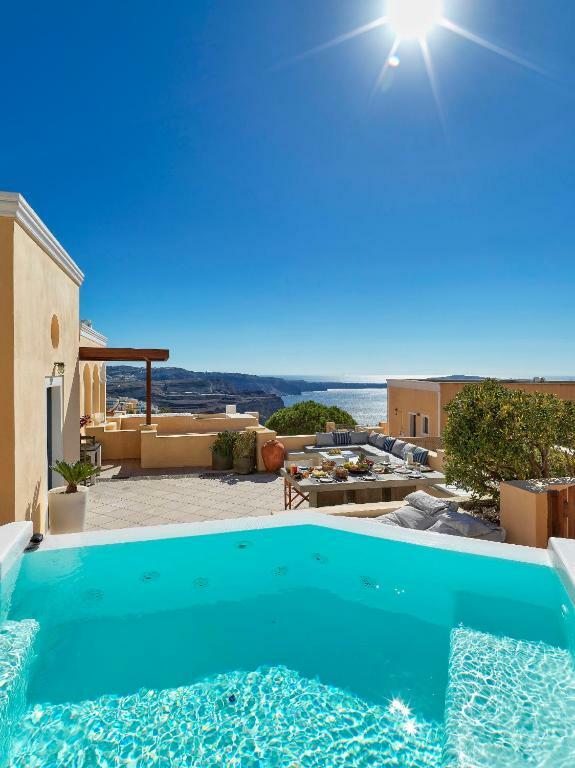 This Villa is fitted with comfortable antique furnishings and contemporary artworks and offers a spacious exterior area with an outdoor hot tub and panoramic views over the Caldera and Aegean Sea. This studio features a kitchenette, balcony and private entrance. Should it be me visiting the island for the first time, I would love to stay at Archipel Mansion. This was my very first impression the first time I saw the property. The view, the location, the décor, the outdoor areas - all near to perfect! I love meeting and conversing with people from all over the world - and live by the saying that you learn something new every day! 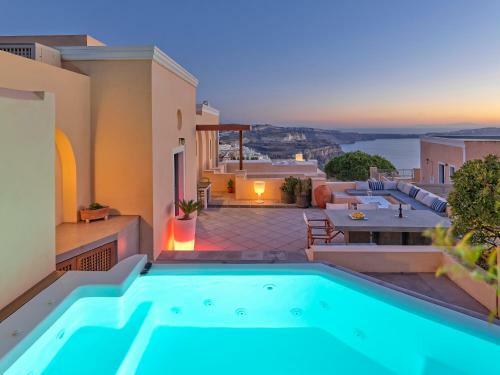 Archipel Mansion is located to the northern highest point of Fira, in the most unspoiled part of the old town, known as Fraggomahalas. 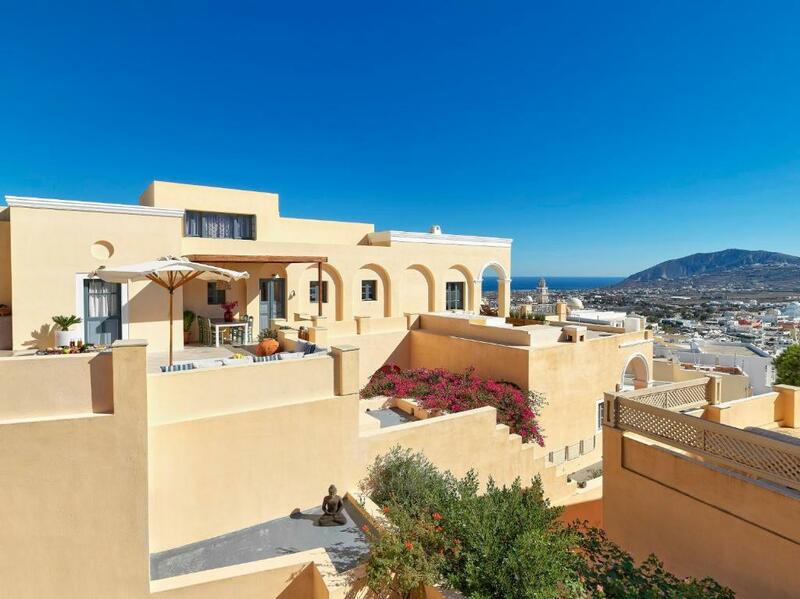 Just above the Mansion you will be impressed by the restored castle-house Goulas, one of the five medieval Casteli of Santorini, the only fully restored. 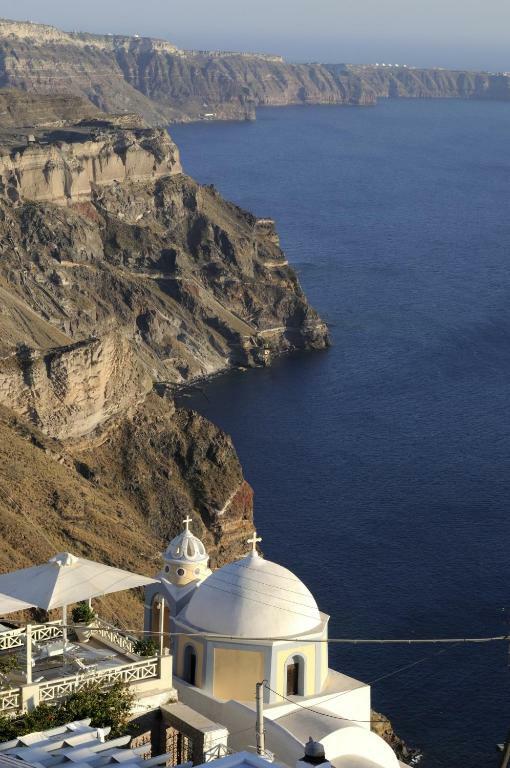 By the edge of the cliff is located the Nomikos conference center, which houses a well known music festival that takes place each September. A few meters below you can visit Megaro Gyzi, a renovated family mansion of 17th century, converted to a cultural center owned by the Catholic Church. Of great importance is the Catholic Diocese complex, comprising the churches of St John the Baptist (mid-17th century) and the Rosaria Dominican Convent (built in 1825). If you find yourself at the time of Holy Mass you will feel –actually listen- the medieval origins of the Order, a tradition that continues to our days with the 14 nuns living permanently at the monastery. Nearby of great interest is one of the oldest mansions in Fira, The Vazegios mansion with Venetian architectural influences. House Rules Archipel Mansion takes special requests – add in the next step! A EUR500 damage deposit is required 14 days before arrival (about USD562.17). This deposit will be fully refunded at check-out, as long as there isn't any damage to the property. Archipel Mansion accepts these cards and reserves the right to temporarily hold an amount prior to arrival. Please inform Archipel Mansion of your expected arrival time in advance. You can use the Special Requests box when booking, or contact the property directly using the contact details in your confirmation. A damage deposit of EUR 500 is required. The host charges this 14 days before arrival. That's about 562.17USD. This will be collected by credit card. You should be reimbursed on check-out. Your deposit will be refunded in full by credit card, subject to an inspection of the property. They couldn’t let me stay longer! Konstantinos is a great host. Great room, breakfast and helpful staff. The hotel is near the cafes/shops and restaurants, few meters away from the bus station. Konstantino was very helpful in booking tours that were hard to get on line.